CAIRO, May 27, 2018 (BSS/AFP) - Egypt's national team's doctor said he was optimistic that Mohamed Salah could play in the World Cup, after the star striker was hurt in the Champions League final. 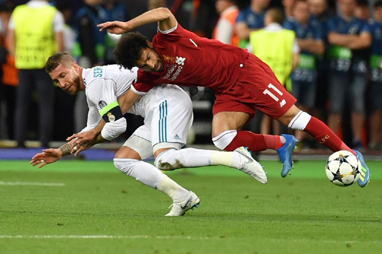 "The Egyptian King" and Liverpool's top scorer was forced off after 31 minutes in the Champions League final by shoulder injury sustained in a tangle with Real defender Sergio Ramos. "Through follow ups on the phone with the national team's delegation in Italy...the officials at Liverpool said an X-ray on Salah's shoulder" showed the injury to be in the ligaments, the Egyptian Football Associated said on Twitter on Saturday. The national team's doctor, Mohamed Abou al-Ela "expressed his optimism that Salah would make it for the World Cup matches according to this diagnosis", the association said. This optimism contrasts with statements by Liverpool manager Jurgen Klopp who said immediately after the game on Saturday Salah's injury was "serious". The Egyptian Minister Youth and Sports Khaled Abd Elaziz also expressed optimism. "Mohamed Salah, god willing, will be on the national team's final list for the World Cup, which is to be announced on June 4," Abd Elaziz said on Facebook. Sadness and anger filled cafes where Salah's fans gathered to follow the Champions League final. Salah had cemented his status as a national hero by leading Egypt to their first World Cup qualification in 28 years. The team's coach, Argentinean Hector Cuper, said a month before the World Cup kick off that The Pharaohs were banking on Salah in Russia.